Type the words “crochet Christmas pudding” into any search engine and you’ll pull up thousands of photographs and ideas! Over the years I’ve come up with several ideas and often my favourites are the simplest. A combination of cream and brown wool, topped with a few red beads or sequins and some green leaves can give you several options. Tiny puddings look so cute strung on the tree, or you can glue them to wooden pegs to hang your Christmas cards (these ones were painted with gold spray). Or why not make pencil toppers or key rings? My favourite is my festive pin cushion. The glossy berries were rescued from a wreath I had bought years before. The mice had nibbled most of it away when it was stored in the attic, but I managed to rescue the berries and they came in very useful for topping these puddings! Here’s my basic “recipe” for a crochet pudding. You can easily modify it by working more rounds of increases (then work a corresponding number of straight rounds and then follow the same principle for decreasing). As usual, use a size smaller hook so that your stuffing doesn’t show through. I always start my crochet with a chain ring, if you’re a fan of the “magic” ring, by all means use that instead. Whatever the crochet police might tell you, it comes down to personal preference and I stand by my chain ring! Let’s be honest, once you’ve stitched on a couple of leaves and some beads, no-one will know the difference anyway. I always feel so frustrated when ladies come to my classes and tell me they’ve seen some gorgeous crochet patterns, but they don’t know how to make a “magic ring” so it’s obviously “too hard” for them (insert sad face emoji). 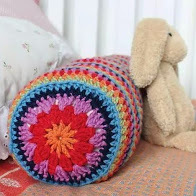 Shameless plug – you can find instructions for lots of different ways to start crochet in the round in my book – with photos to help! Of course, try the method recommended by the designer, but if you get in a pickle, there’s no shame in sticking with what you know. For 40 years I only knew one way to cast on my knitting, but that didn’t stop me making all kinds of toys, scarves and jumpers – and no-one ever said I wasn’t a “real” knitter! Anyway, I digress. Back to our puddings. 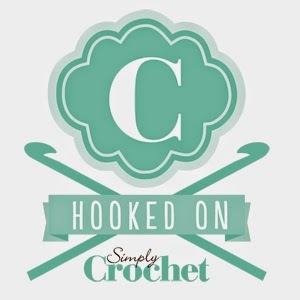 I write my patterns in UK crochet terms and you’ll find a list of abbreviations here (links to Inside Crochet – a great resource for crocheters). With white yarn, make 4ch. 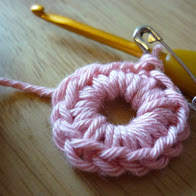 Join with a slip stitch to make a ring. Fasten off white yarn and join Brown to any dc. Rnds 4 – 6: 1dc in each dc around. Stuff pudding with hollowfibre toy stuffing, old tights or wool tops. Cut yarn and use a tapestry needle to draw the yarn through the remaining stitches, pull tight to close and weave in ends. Use oddments of green yarn to make leaves. For tiny ones, make 4ch, skip first ch, make 1dc in each ch, slip stitch in same place as last dc and fasten off. You can also cut leaves from felt. For my pin cushion, I used my free mistletoe pattern (you’ll find links and more ideas in the “12 Makes for Christmas” tab. Or, look out for my holly leaf pattern tomorrow, when I’ll be unveiling my 2018 British Wool wreath.